The Mirror Orchid (or: Mirror Bee Orchid) got its name from the bluish centre of the lip. The rather small plant with a height of 10 to 25 cm carries two to eight flowers, with the greenish lateral sepals spreading out. The dorsal sepal forms a hood. The small petals are triangular and reddish-brown. 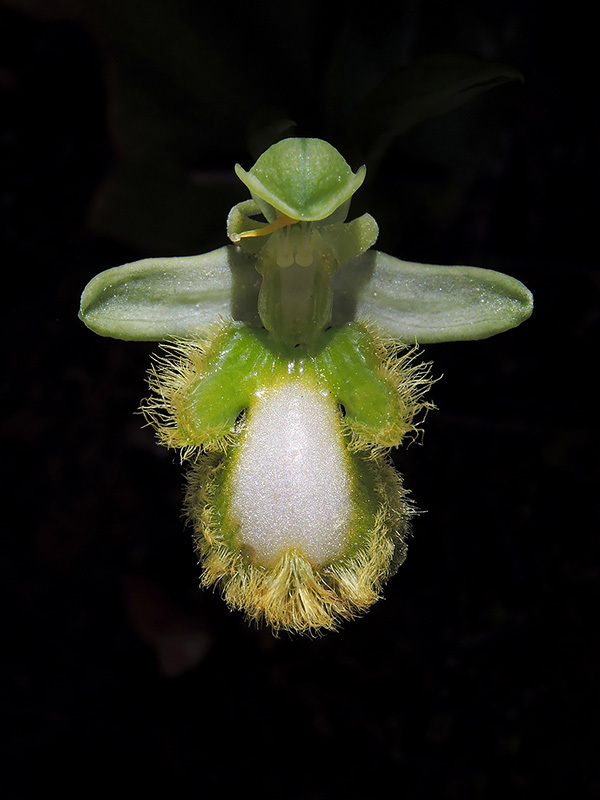 The three-lobed labellum is surrounded by a band of thick velvety hairs. The sides of the stigma have marked pseudo-eyes. The very rare plants with a loss of pigments have green sepals, green petals, green lip borders and a white lip centre. Ophrys speculum grows in the southern Mediterannean – from Greece to Spain and Portugal – on meadows and dry soils, up to 1200 m. Bloom is from March to May.